The book has two main divisions. 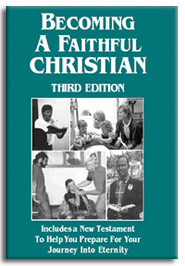 The first part (approximately 300 pages) is a discussion of how to become a Christian and how to live as a Christian. This section assumes that the reader has never heard the gospel and may not have another opportunity to hear. He is introduced to God, Christ, the Holy Spirit, the inspired Scriptures, the earthly life and death of Jesus, the Resurrection, and the church that Jesus built. He is then told how to become a Christian and live as one in his community. There are instructions on how to be baptized and how to establish a congregation, as well as suggestions on organizing worship services.